Consolidated PBY Catalina (in action series) The iconic PBY Catalina was not only the work horse of the U.S. Navy's patrol bomber units during World War II, but also served admirably with the Royal Air Force, Royal Canadian Air Force, and others. Airmen aboard British PBYs were the first to spot the German battleship Bismark/Bismarck German Battleship when it broke out into the North Atlantic in May 1941, and U.S. Navy PBY crewmen were the first to observe the Japanese fleet as it stole towards Midway Islands in June 1942. In addition to keeping a watchful eye out for enemy activities, Catalina crews also rescued countless downed airmen as well as sailors from stricken ships. 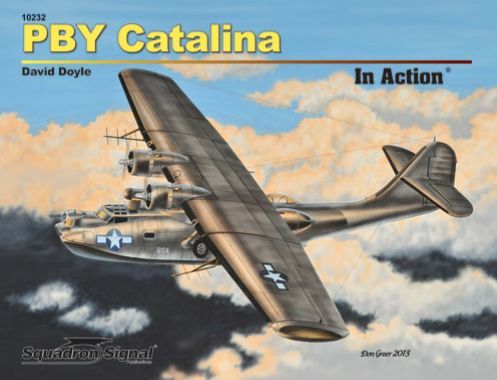 Through daring bomb and depth-charge attacks on enemy vessels, Catalina airmen also contributed directly to the defeat of the Axis powers in combat. This all-new 80-page volume from Squadron tells the story of the Catalina through over 200 vintage photos, over 30 of which are in colour, as well as eight color profiles and numerous detailed line drawings. Illustrated with more than 210 photographs; 80 pages.